Its a big, shareable omelet slathered in goat cheese. Enough said. Spread out butternut squash on a lightly greased baking sheet and bake in a 400 degree oven for 15 minutes, turning once half way through the baking time. Once butternut is removed from the oven, preheat the broiler on low. Add baking soda to whisked eggs and stir to combine. Sauté kale, garlic, onion and mushroom in a medium sized, oven safe pan over medium heat. Season with salt and pepper. When kale is wilted and garlic is fragrant, add butternut squash and mix vegetables so they are evenly distributed. Pour the eggs over the vegetables. Lower heat slightly and cover pan. Cook for 5 minutes or until the bottom and sides of the frittata are solid. Transfer the frittata to the oven and broil on low for 5 minutes or until the eggs are solid throughout. Add goat cheese, white wine and parsley to a small sauce pan and simmer over medium/low heat. Whisk together until smooth and silky. Reduce until sauce is thick but drizzle-able. 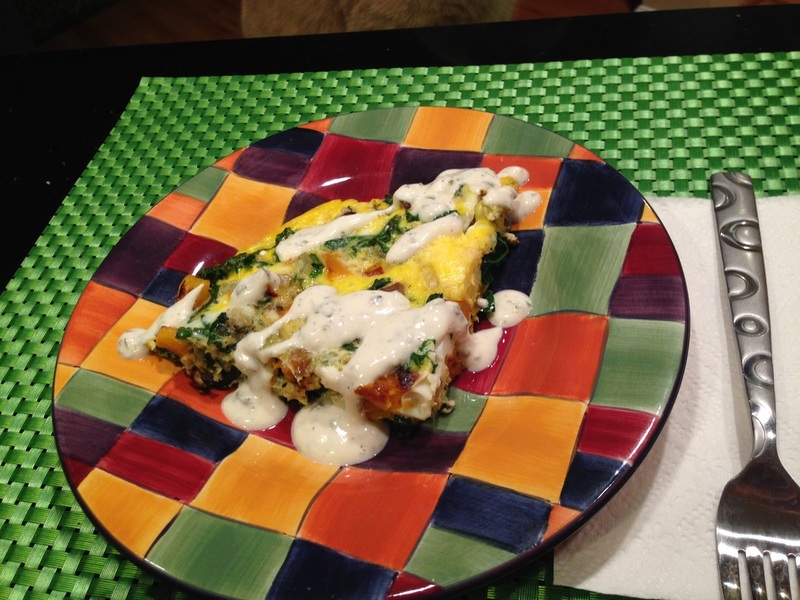 Cut frittata into 4 pieces and serve each piece with goat cheese sauce drizzled over top.